is my kid vomiting to rice??? Since when did rice have proteins in it? OK, so now that we're all on the same page in understanding that proteins are in everything we eat, lets move on to how that affects us all in the FPIES world. As far as FPIES is concerned, there is no food that contains more protein than another. They all have proteins, and your child's digestive tract is not reacting to foods with "more protein." It's not like there's a sliding scale of foods...foods with just a little protein on one end and foods packed with protein (like meats) on the other end, with our children reacting more to the foods at the top of the scale. If that were the case, FPIES would be SO much easier to navigate as a parent, just stay away from the ones with "more." We wish it was this easy! Instead, it's all about the protein structure itself. This is why our children react to things like rice and peas, but can go on to pass beef or pork. Our children's digestive tracts are reacting to specific protein configurations. Failing peas would knock out the legume food family for future food trials, because the legumes all have a similar protein structure. 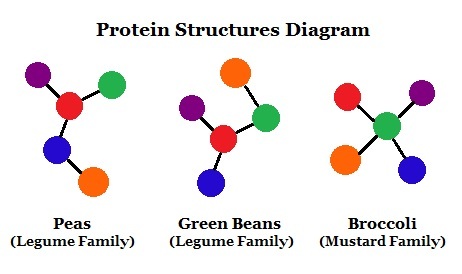 Other food families have entirely different structures, some that are similar to the legumes, and some that are not. You'll never know which "structures" your little one's gut will react to (or will pass!) until you try, and though the food family theory is a great place to start, some kids react to only some foods within a family, while passing others. In the diagram above, you can see that both "peas" and "green beans" have the same basic structure, with red in the middle and purple, green, and blue arranged in the same order around the red. The only difference between the two is where the orange is attached. "Broccoli," on the other hand, has a totally different arrangement from the other two. This represents the similarities and differences between food families. The basic components of proteins within the same family are the same, with your child's digestive system treating both "peas" and "green beans" the same, recognizing them both as either safe or trigger foods. This helps us predict the likelihood of a child passing or failing foods foods from the same family. It's not full-proof, but until there is more research, it's at least a place to start when you are choosing foods to trial with your child. So when you're starting out, try to stay away from foods within the same family as your child's triggers since they have similar protein structures. Trial foods that are either in the same families as your child's safe foods, or foods that have a high pass rate among children with similar safe/trigger foods as your child (by sorting the raw data on the food survey by your child's safe and trigger foods). Following these tips will give you a little confidence moving forward with food trials, instead of blindly choosing foods at random. Hopefully this explanation has helped you to better understand what the "P" in FPIES really means. Selecting foods for trials is a nerve wracking process....you're hoping and praying that they pass the food, but scared to death that you just fed your child something that will make them sick. Understanding how proteins play a part in FPIES is key in making informed decisions to keep your child as safe as possible while adding to their safe food list.